SWEET AS CANDY IN SUGAR Look sweet as candy in a little girl's pageant dress by Mac Duggal. This collection offers vibrant colors and many unique silhouettes for every kind of beauty queen. With a unique twist to every dress, you will be sure to stand out with the judges. Take a look at the Sugar by Mac Duggal Collection here on Diane & Co's website or come visit our store. We have an entire area dedicated to our favorite little shoppers. 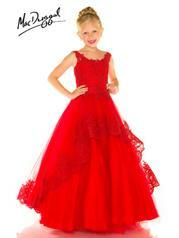 Your princess is sure to shine in this more mature pageant gown! The beautiful floor length skirt has a high low layer of embroidered tulle. The heavily beaded bodice and lace- up back creates just the right touch of glam and glitter the dress needs. Don't miss the dazzling beaded shoulder straps as well! Look like your favorite piece of candy in a little girl's pageant dress by Sugar. This collection of fun candy colors is sure to leave a sweet taste in the judges' mouths. The designer for Sugar by Mac Duggal incorporates beautiful colors reminiscent of joy and fun. To add a little something extra to your look, it's always a good idea to add hair accessories.